Surprise Tennis & Racquet Complex was recently named as a USTA Outstanding Facility Award winner for 2008 for their excellence in tennis programming and support of the USTA's mission. "We're thrilled that we won the award," said John Austin, Tennis Director of the Surprise Tennis & Racquet Complex, which celebrates its first complete year of operation in October 2008 . "We are so excited and proud of (the Tennis & Racquet Complex). It's a world class tennis site, especially for it being such a new facility. The city of Surprise developed a true tennis vision when they built this place and they really support it." Surprise Tennis & Racquet Complex supports a wide array of USTA programming, including USTA League Tennis, Jr. Team Tennis, and holds several local junior and adult USTA sanctioned tournaments. 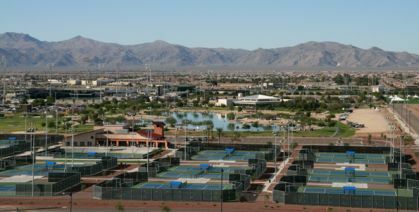 The site was also home to a USTA $10,000 Pro Circuit women's event in early 2008, and, in 2009 will be used as the site for the 2009 USTA Tennis on Campus National Championships and a USTA Super Senior League Tennis National Championships. In addition, the 25 "US Open blue" courts at Surprise have a pristine lighting system that is one of the best in the nation, extra running room on each court. Courts are also laid out in embankments of two for easy spectator viewing and to lessen court traffic, giving a more secluded playing experience.